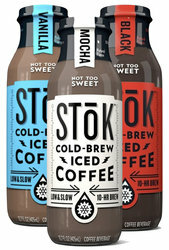 Stok Cold Brew Coffee. Coffee brewed at a lower temperature to bring out every drop of the smooth, bold flavors in the coffee. Each batch is steeped for over 10 hours to bring out the flavor. We have 3 great flavors available: Black, Mocha and Vanilla. Each bottle is 13.7 oz and should be enjoyed cold. Coffee brewed a a low temperature to bring out the smooth, bold flavors. 3 Great flavors: Black, Mocha and Vanilla. Each bottle is 13.7 oz.